FILE - China's Foreign Ministry spokesman Hong Lei conducts a news conference in Beijing. China said Friday it respects freedom of navigation and overflight in the South China Sea despite reports its ground controllers issued warnings to U.S. strategic bombers flying over the area this week. Foreign Ministry spokesman Hong Lei said Friday that China opposed flights that used such freedoms as mere legal cover, strongly implying that Beijing considered the flights by the B-52 bombers on Sunday and Monday as an excuse to challenge China's territorial claims in the South China Sea. China “firmly opposes violating international law and undermining China's sovereignty and security interests under the pretext of navigation and overflight freedom,” Hong told reporters at a regular news conference. FILE - A B-52 strategic bomber from the United States Air Force. 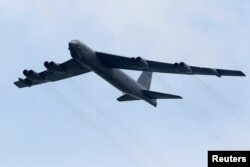 Pentagon spokesman Bill Urban said Thursday the pair of B-52s flew routine missions in international airspace in the vicinity of the Spratly islands and received two verbal warnings from a Chinese ground controller. Urban said neither plane came inside the territorial airspace of any island or maritime feature and that they completed their missions without incident. 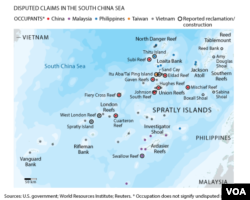 China claims virtually the entire South China Sea and its island groups as its own territory, and has vigorously protested missions by U.S. military planes and ships intended to assert freedom of navigation in the area. A U.S. missile frigate last month sailed inside the 12-nautical-mile (22-kilometer) territorial limit of one of China's manufactured islands in the contested Spratly group, bringing a heated protest from Beijing. The U.S. says it takes no position on sovereignty claims in the area, but insists that ships and planes of all nations have the right to operate in the sea through which passes more than $5 trillion in trade each year. The South China Sea is expected to linger in the background when President Barack Obama attends the Asia Pacific Economic Cooperation forum in the Philippines next week, and later have meetings with Southeast Asian leaders in Malaysia. A U.S. treaty ally, the Philippines has strongly contested China's territorial assertions. Brunei, Malaysia, Taiwan and Vietnam also exercise claims in the region.